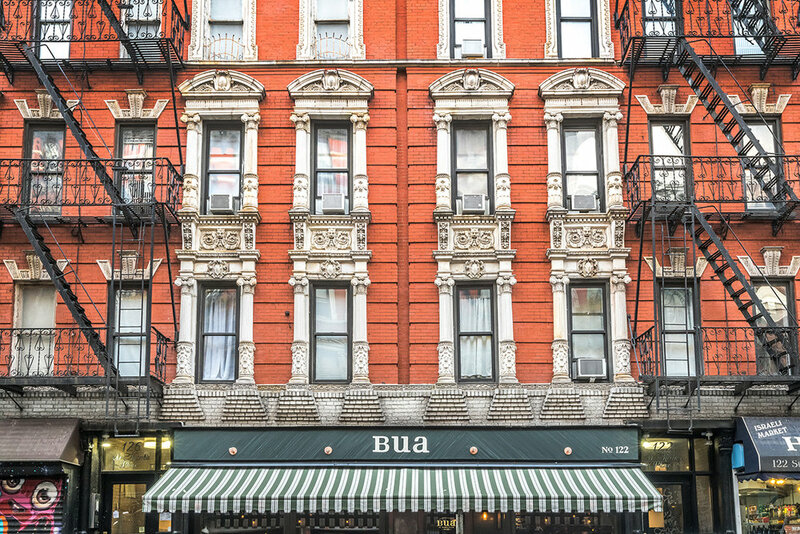 After thirteen years of helping to define the unique fabric of retail and hospitality on St. Marks Place in New York, Bua decided that it needed to reassess its presence in a changing landscape. The site's history as a staple to bar life in the East Village dates back to even before its current namesake and ownership. Even in its first life as Noah's, key design interventions were combined with the existing textures of brick, plaster and concrete that historic buildings in the big city get for free. Since then, each update has been a combination of balancing existing with new to help the space evolve without ever removing enough to jar the soul of the space in the eyes of patrons and locals. New materials and lighting deployed in key areas helped to walk the line of "same but different". Many attributes of the space that were all but irreplaceable (the large tilting streel-framed storefront, the century-old brick party walls, the well crafted back bar) were allowed to remain as anchors so that organization around new, cleaner lines could serve as a backdrop to aging authenticity.